Who hasn’t wished you could immediately transport yourself, Star Trek-style, to events around the city? While hopefully engineers are looking at how to make this happen, in the meantime many organizations are facing very real challenges related to helping youth move about so they can take advantage of all of the opportunities in Chicago. 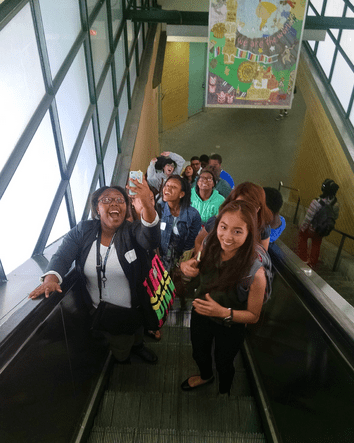 Most of the teens we work with are completely dependent on public transportation in getting from place to place, which means they have to navigate complex transportation challenges. Not only do teens have to worry about how to physically use different transportation options and having enough money to do so, they also need to feel safe and comfortable in accessing bus stops and train stations. Hive organizations and other youth program providers are widespread across Chicago, but we all recognize there are youth in different urban areas that we are just not reaching. The benefits of out-of-school time and after school programming has been widely researched. Youth involved in our programs are more likely to attend classes, graduate high school, avoid peak times of violence among teens, and avoid drug and alcohol usage (Afterschool Alliance). These benefits are enough to validate great steps in getting youth to programs that meet their interests, needs, and career goals, whether or not the programs are in their immediate neighborhood. So how can we make getting to all of our opportunities more safe and easy to access for any teen across the city that might want to participate? In exploring this issue, the Transportation Moonshot Group has focused on three main issues: equity, accessibility, and safety. Many of us already try to help teens with accessing public transportation – from providing busing to paying for public transportation costs to setting up programs within communities – but is there a citywide solution for making transportation more accessible and giving youth the support they need to effectively use it? As a primary Hive goal, equity is at the forefront of our minds as we discuss transportation. To us, equity means that everyone has equal access to programming that wants it. We have cores of dedicated teens that feel strongly enough about our programs and opportunities that they make extraordinary efforts to attend. But how can we reach youth that we’re not serving? What’s stopping them from coming? We already know that transportation is at the heart of some of these reasons, but we need to figure out – on a network level – why those youth are not participating and what steps we could take to make sure they feel empowered to access programs if and when they want to. The clearest way to address equity may be to take greater strides in moving programs to youth where they are. Organizations like LevelUP are located in the heart of communities. In considering how we might take more programs to individual neighborhoods, we will need to collaborate on identifying target areas in order to maximize our network effect. Ultimately we also need to consider safety issues. Especially within organizations with a local community-focus, teens often voice concerns about traveling on specific blocks or taking routes that are much longer just to avoid some areas. How might our solutions help make youth more comfortable and safe while traveling back and forth between programs? Some of our colleagues from Free Spirit Media and the Anti-Cruelty Society have described teens that stop coming to programs because they’ve been mugged while in transit or can’t access bus stops that are across the street from their schools because of gang boundaries. Violence is prevalent in many Chicago neighborhoods and at least some of our high-level solutions need to address how to help youth navigate this reality. We know that transportation is something we all consider in our day-to-day work with youth, and many of us have solutions that work on a small scale, but we strongly feel that by combining forces, we can start to address underlying issues that are affecting us all. By “Shining the Light on Transportation Constraints,” we hope to raise awareness that program accessibility and community safety deeply affects issues of equity, and that by addressing some of these constraints, we will improve the lives of Chicago youth. It can be hard to identify workable solutions without knowing exactly what where teens are coming from now and where they’re going to. Our current exemplar solution is to build a visualization showing generalized movements of youth as they go from school to programs to home. This visualization could then be present at highly visible events around the city – from Maker Parties to Chicago City of Learning showcases. Increasing awareness of how teens move around the city would hopefully spur some action on a higher level, perhaps even leading to dedicated youth busing options or #freecta4youth. Another potential solution is to expand Safe Passage routes and staff to encompass after school and weekend programs. The presence of adults with a vested interest in the health of their communities can help deter potential safety issues and ensure youth are comfortable in getting to programs, bus stops, and train stations. In this re-imagined jitney service for youth, there would be a dedicated shared ride service for teens. We can envision a community-based solution where youth text a provider when they need a ride and are transported to programs free of charge. What would it look like if youth had free access to Divvy bikes, or programs loaned bikes instead of laptops to youth that wanted them? That’s the heart of our bike-focused solution. Bikes can open up doors to teens by making many other public transportation options more accessible and giving them a sense of familiarity with new areas of the city. Our group is just a small representation of the Hive Chicago network and there are likely more challenges out there than we’re addressing. A potential solution on a neighborhood scale may be to start campaigns that deal with very specific challenges and solutions. Civic Art Works has a platform ready for your use! Start a campaign to organize some community action and when you do, let us know so we can all chip in to support your solution. The issues around transportation don’t just affect one of us – we all encounter these challenges and all of our youth deal with them every day. It will take one – or many – network-level solutions to achieve a system where any teen in any part of the city can access any program they want. There is no easy fix, but let’s start the conversation! Get involved by letting us know what’s going on in your programs. What challenges do your youth face? Do you have solutions that are really working for you? Let’s get together some solutions that we can partner on and see what might help relieve some of the most pressing transportation constraints.